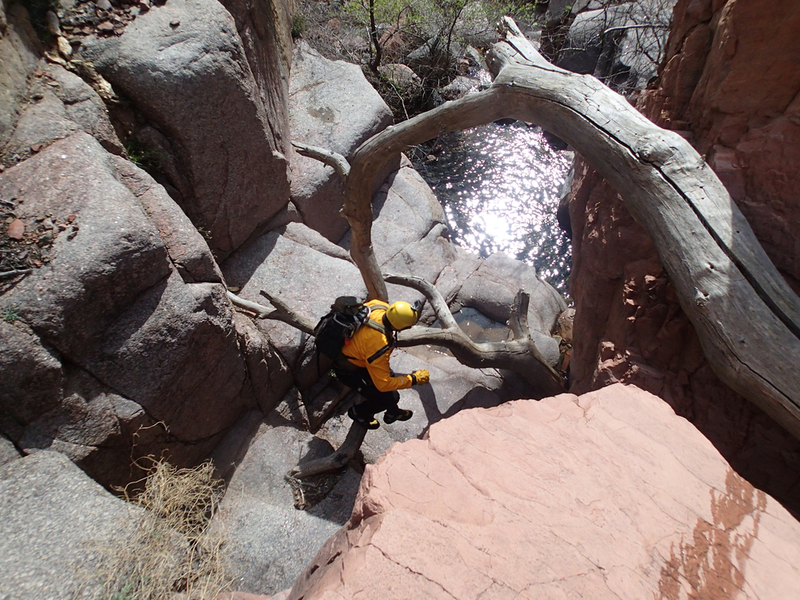 Waterslides Canyon, AZ - Technical canyoneering description, location, GPS route, photos, topographic map, and weather information. 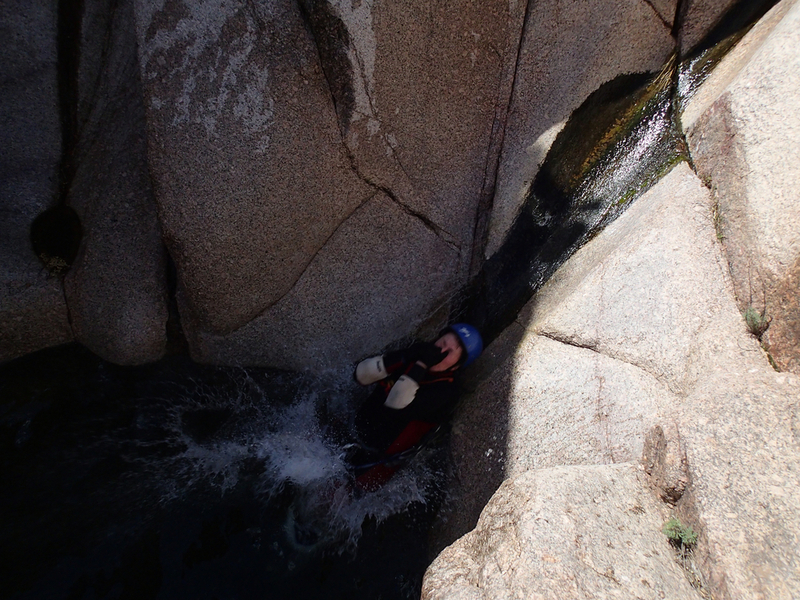 Waterslides canyon makes for a fun day out in the Sierra Ancha Wilderness where you can hang out, play around in the pools and run laps on the natural slides. Its best to catch the canyon in early spring when the water is flowing cold and clean. Driving in is accomplished by taking the Globe/Young highway a short distance where you then turn onto Cherry Creek road and wind your way in. The following description is for the shuttle route where you work your way into the slides through a scenic section of quartzite rock followed by a conglomerate layer, with roughly 5 drops and a down-climb or two . The slide area can also be reached by hiking up from the bottom starting at Cherry Creek Road if desired. Many prefer to come in the night before and sleep at either the lower or upper camp area, but a long day trip to the area is not uncommon. The lower camp is just a decently flat sandy area next to the creek where sleep can be had if your arriving late or waiting to meet up with others before driving up. The upper camp is a pull off on the right hand side as your headed to the top just prior to the upper parking area that is next to a small grouping of trees. With your vehicle at the lower shuttle area, it typically takes around 35 minutes to make your way up to the top. This road to the top is primitive and not regularly maintained, high clearance can be helpful, but we have taken many stock full size trucks up this road without issues. 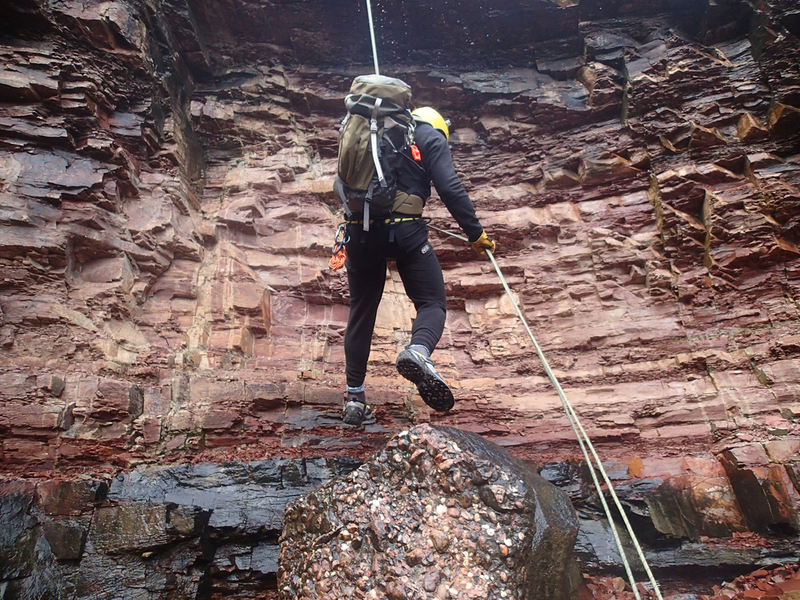 Once up top it is a short walk to the creek bed and the action begins almost immediately with the first rappel. In total, there are about 7 rappels (we typically bring a pair of 120' ropes) and only need the second as a pull on the last drop or keep both out to speed things up. 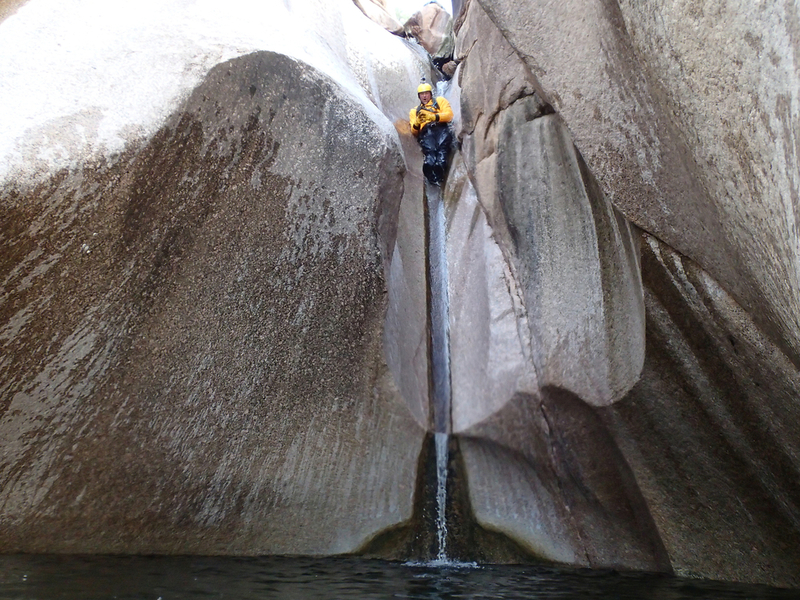 Throughout the fist section on your way to the slides it is easy to avoid getting soaked, but typically there will be flow that trickles down onto your head in a spot or two while on rope. A short section of walking down the creek bed will eventually turn into smooth granite and indicates the beginning of the slide area. 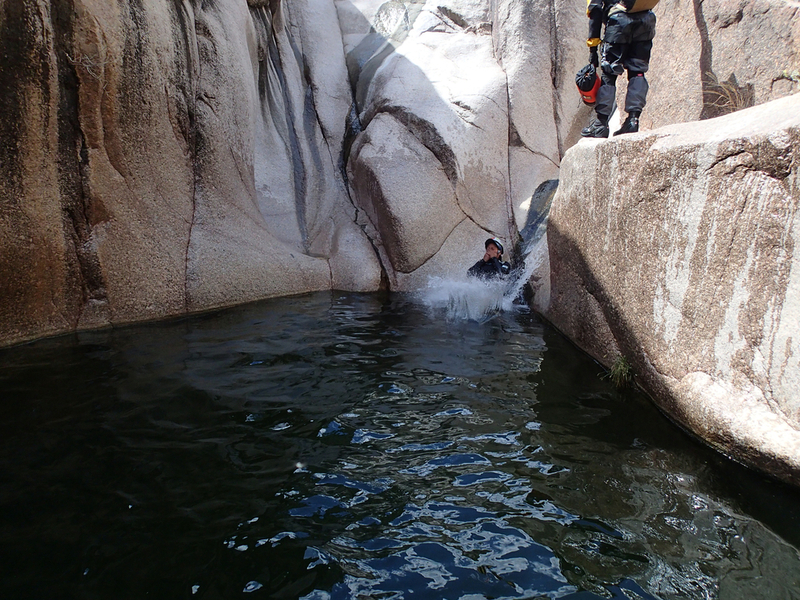 Depending on the weather and water temp you may want to drag on your wet suit or dry suit around this area, although some of the pools prior to the slides are nice to wade through on a warm day. There are three major slides in the area along with several small slides, down climbs, hand lines, jumps, and pools. It is always best to check for debris before committing to a pool as a log or rock just below the surface can make for an extremely bad day. With the major slide area completed two more drops lie ahead before you gear down for the hike out. With the technical section completed the hike out consists of making your way down the stream bed, utilizing the occasional cow trails on each side when available to make it as easy as possible. You should be able to see your vehicle on many occasions in the distance to keep you on track during your exit.